The week-long event at North Korea's Diamond Mountain resort comes as the rival Koreas boost reconciliation efforts amid a diplomatic push to resolve a standoff over North Korea's drive for a nuclear weapons program that can reliably target the continental United States. Buses carrying about 90 elderly South Koreans and their family members were moving into the Diamond Mountain resort after crossing into North Korea. Earlier in the morning, the South Koreans, some in wheelchairs and aided by Red Cross workers, had left the buses briefly to enter the South Korean immigration office in the eastern border town of Goseong. They were reunited with their long-lost North Korean relatives on Monday afternoon at the start of a three-day reunion. A separate round of reunions from Friday to Sunday will involve more than 300 other South Koreans, according to Seoul's Unification Ministry. 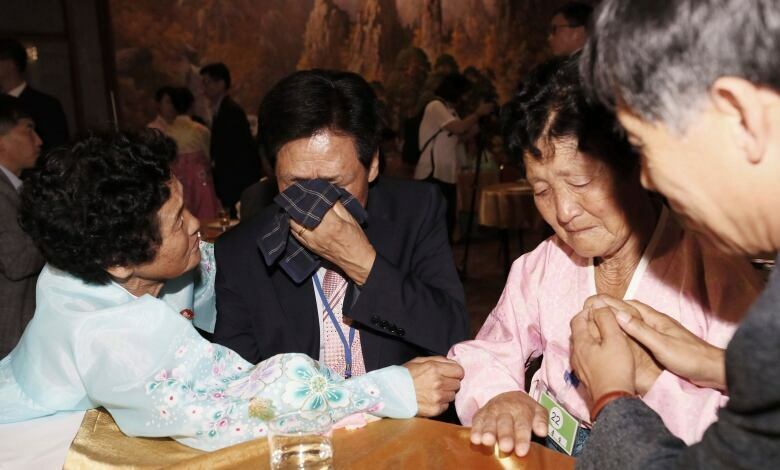 Past reunions have produced powerful images of elderly Koreans crying, embracing and caressing each other. Nearly 20,000 people have participated in 20 rounds of face-to-face reunions since 2000. Another 3,700 exchanged video messages with their North Korean relatives under a short-lived communication program from 2005 to 2007. No one has had a second chance to see their relatives. Many of the South Korean participants are war refugees born in North Korea who were meeting their siblings or the infant children they left behind, many of them now into their 70s. "How many children do you have? Do you have a son?" Lee Keum-seom, 92, asked her 71-year-old North Korean son during their first meeting since they were driven apart during the turmoil of the 1950-53 Korean War. Hugging the woman he had last seen when he was four years old, Ri showed his mother a photo of her late husband, who had stayed behind in North Korea with him after being separated from his wife while fleeing south. "Mother, this is how my father looked," Ri said. During the three years since the reunions were last held, the North tested three nuclear weapons and multiple missiles that demonstrated they potentially could strike the continental United States. North Korea has shifted to diplomacy in recent months. Leader Kim Jong-un and South Korean President Moon Jae-in, a son of North Korean war refugees, agreed to resume the reunions during the first of their two summits this year in April. South Korea sees the separated families as the largest humanitarian issue created by the war, which killed and injured millions and cemented the division of the Korean Peninsula into the North and South. The ministry estimates about 600,000 to 700,000 South Koreans have immediate or extended relatives in North Korea. But Seoul has failed to persuade Pyongyang to accept its long-standing call for more frequent reunions with more participants.